perfect to cover paper mache eggs for Easter. The colors are so pretty for spring. Here are a few finished with trims. I used vintage hemtape frayed, silk roses, tulle and glitter for the little roses. Pretty for spring, don't you think? And a few using tissue papers in damask. is a Dry It Board. give you a spot to lay your work down to dry when painting or gluing. These covered eggs are fun to do, but a bit messy. as I apply the glue with a paint brush with the right hand. to go with my gift. as she designs gorgeous cards with envelopes. I gave a try to line my envelope to go with the card. I found in an card book. and layered with foam dots and sticker words. and blue and white dot paper to write a message. taken from the baby announcement. and lined it with the blue and white. As you might realize from the colors, the baby was a boy!! Never have I seen more beautiful Easter eggs. They are absolutely gorgeous! I am very ready for spring. It has been an incredibly long winter. Your eggs have brought a touch of spring to my day. That floral paper is perfect for Spring and Easter eggs, Celeste! I tried doing those eggs last year and I remember how messy it was. : ) Love your card. How pretty it looks when the inside of the envelope coordinates with the card. The Easter eggs are pretty and I like the idea of a dry it board which is new to me. Your card is lovely too. Thanks for sharing your Sweet, Sweet Easter Eggs. I am intrigued with your drying board, I have never heard of one and it's purpose is wonderful!! There are so many possibilities with the eggs...I love the soft pastels. And the card and envelope are beautiful...handmade is always so much more special. Sweet hugs! These eggs are adorable - I love the...guess, which ones I love the most...OK, I bet you got it didn't you? The Toile - black and white! But, they're all pretty. What a beautiful card for the new baby!! Great job. I've never had the patience for the "little, delicate" work you do. But...give me some yarn and a hook...and I'm off!! Thanks for you comment about my new Blog Banner - I had fun creating it. The eggs are so pretty and the plate is adorable that you found. Those are GORGEOUS, Celestina Marie. Can you believe we are to the point where we are thinking about Easter already?...although anything to get through this winter weather works for me! I love that little plate, too, but those floral covered eggs are just darling!!!! What fun to have a few of them in a bowl or basket. I have never heard of that DryIt board but I am going to look for one. What a GREAT idea! The eggs are stunning! Are they real eggs or plastic ones? The card is so pretty and one that will be kept forever. Love the plate - they always have such unusual items. love your cute decorated eggs and lacey looking plate, celeste:) and diane is an awesome inspiration, isn't she?! such a sweet baby card and envie! Those eggs are simply gorgeous, Celestina! I love all of the photos! Thank you, for sharing and inspiring! Love the eggs...so pretty for Spring and Easter!! Such a delightful post full of beautiful creations. You are certainly talented. Always a joy to visit. I love your paper covered eggs! So pretty! I love visiting your blog. So inspiring. Hi Celeste! I came by yesterday but got side tracked and had to leave before I could leave a comment. Now I can. The eggs are just beautiful! You truly are the most creative one. The card and envelope are darling! You're the best. Your eggs are so pretty,Celestina! What a great idea to use the pretty vintage wrapping paper. And even better that you scanned it so you can save the originals. The tissue paper eggs are gorgeous and are my very favorite! Such a cute card you made, you have been on creative roll! Your Easter eggs look lovely! The card is beautiful, what a thoughtful keepsake for the new parents! Your vintage eggs are so pretty, Celestina. What a clever idea. I love the black and white damask ones. Jess loves the damask design very much. These will be nice as part of your Easter décor. I just saw a skinny bunny today and couldn't resist buying her. Me and you are already thinking of Easter - what a blessed holiday it is. What sweet eggs! 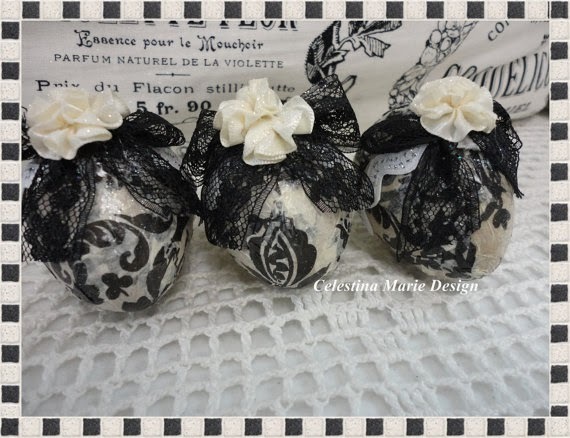 I just love black and white and damask, so those are my favorite, but they are both so cute. Good morning, Celeste! I've been trying to work my way to your page for days now, and I must say I've had a delightful time catching up with all your latest creations today. I love paper mache on Easter eggs, and these are beautiful. You know me, my eye gravitates toward the black and white ones. :) They are all perfect. Many blessings to the new baby boy and his loved ones. Love the card. Spending a little more time away from the computer these days, but I'm still here, friend. Hi Celeste! I'm popping back in to take another peep at your darling eggs! Thanks so much for coming to see my little cows. Your Easter eggs are so cute. I especially like the black and white ones. Congratulations on new baby in your family. Babies brighten everyone's day. The eggs are gorgeous and it is your finishing touches that make it perfect! And you make cards tooooo...So cute...Girlfriend, you can do it all! PS: you were not help choosing a bag lol! Love the pretty Easter eggs you have been making - looks like fun. The Dry it board looks like a good thing to have. Congratulations to your new precious baby in the family and love the sweet card you made. 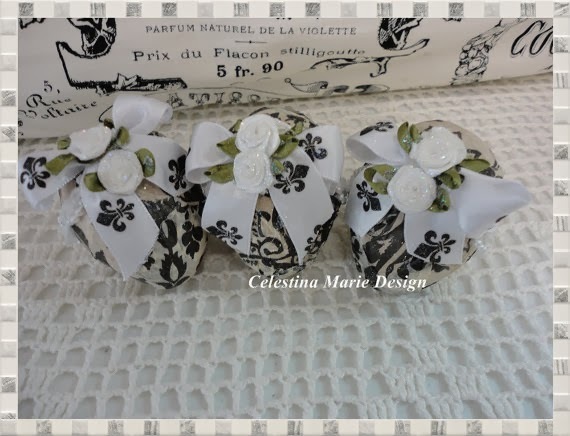 Very sweet and beautiful eggs, great idea to use the vintage papers! Oh, Celeste! I just smile when I see your pretty smiling face in my comments! You light up the whole list! Have a wonderful weekend. Hi Celestina Marie. Your eggs looks gorgeous. Love the card too. Your card is so cute. Love they saying with the star shapes ~ you're so coordinated! You've got a head start on Easter decorating with your pretty eggs! And the baby card and envelope are adorable! They will be a keepsake for the new parents! Love your eggs done in the vintage wrapping papers. Great idea to copy it too! The dry it board is a great idea also Celeste... I've seen things that would work kind of like it. I thinks moi needs one! Your creations always amaze me Celeste. I just got some Easter things out yesterday to urge spring to show it's face! I have snowdrops blooming in the front flower bed so there must be something they know that I don't. The snow is finally gone and we're thanking the Good Lord for that.